The second in our golfing trinity at Augusta is the Golden Bell, Hole 12, par 3, and only 155 yards. I was thinking that with it being only 155 yards, it'd be fairly easy. (I can say this with absolutely no authority, since I've never been on a golf course to actually golf.) But, from what I understand, this hole has a supremely narrow green, with Raes Creek in front, and a bank of azaleas and Golden Bells behind it. On top of that, hit that corner on a windy day, and man, are you in trouble! 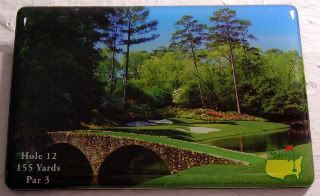 Historically speaking, the original name of the tournament was the Augusta National Invitation Tournament, and it wasn't for another five years (1939) that they could convince Bobby Jones to go with the name the Masters Tournament. I imagine that it takes years for any golfing event to build up an audience, so I'm betting those first couple of years it was Bobby and his buddies rounding up everyone they knew to come out to Augusta to watch some guys hit a ball around. But, even without being an official PGA TOUR event, judging by what I saw on tv this weekend, it's certainly well attended, with guesstimates being somewhere around 35,000 folks a day. Whoa. I can't even imagine. Of course, now, I've got this insane urge to watch that cuteboy Jim Caviezel play Bobby Jones in Bobby Jones: Stroke of Genius, and also to see that cuteboy Joel Gretch play Bobby Jones in The Legend of Bagger Vance. Then again, I've also got a hankerin' to see Happy Gilmore, Caddyshack and Tin Cup, too.